The following diagram summarizes certain aspects of our corporate structure. (1) For information regarding our ultimate shareholders please see ‘‘— Our Shareholders’’ below. (2) The Existing Bank Facilities (including Facility H) under the Senior Credit Agreement rank equally in right of payment. Facility D under the Senior Credit Agreement is a second lien tranche which in certain circumstances will receive proceeds only after the other facilities under the Senior Credit Agreement. (3) These entities are all members of the KION Group. Total revenue, total assets and Adjusted EBITDA presented have been prepared on a consolidated basis. While the Issuer is consolidated with the KION Group for accounting purposes, it is not affiliated with us and does not belong to the KION Group. (4) The other borrowers under the Existing Bank Facilities are Superlift UK Limited, KION France Services S.A.S., Islavista Spain S.A.U. and Linde Holdings Limited. 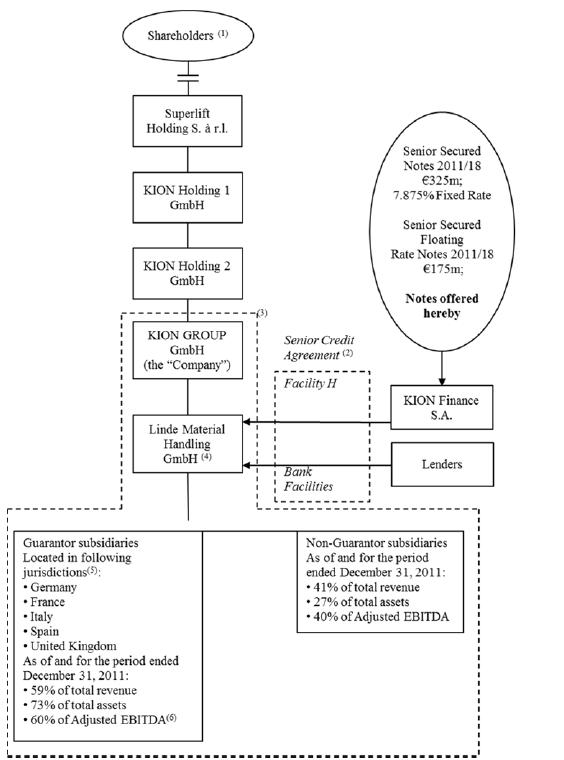 (5) In 2011, we incorporated financial services subsidiaries in each of Germany, France, Italy, Spain and the United Kingdom, which all are Guarantor subsidiaries, other than KION Financial Services Ltd.
(6) Adjusted EBITDA for guarantor subsidiaries includes KION GROUP GmbH. Our principal shareholders include Goldman Sachs Capital Partners, investment partnerships controlled by Goldman, Sachs & Co. and certain of its affiliates, and investment partnerships controlled by KKR & Co. L.P. and certain of its affiliates. Since 1986, Goldman Sachs, through its Merchant Banking Division, has raised over $82 billion of capital for corporate investments through 16 investment vehicles (including equity, mezzanine, senior secured loan and distressed funds) (together “GS Funds”). Founded in 1976 and led by Henry Kravis and George Roberts, KKR is a leading global investment firm. With offices around the world, KKR manages assets through a variety of investment funds and accounts covering multiple asset classes. KKR seeks to create value by bringing operational expertise to its portfolio companies and through active oversight and monitoring of its investments. KKR complements its investment expertise and strengthens interactions with investors through its client relationships and capital markets platforms. KKR is publicly traded on the New York Stock Exchange (NYSE: KKR). For additional information, please visit KKR’s website at www.kkr.com.